August 26, 2013 -- Granger Aerospace Products has received TSO authorization to complete the process of bringing its revolutionary line of ULD containers to market. Granger Plastics Company expanded into the Aerospace Industry in 2012. Expansion included launching Granger Aerospace Products as a division of the rotational molding company as well as outfitting Granger's manufacturing facility for production of aerospace products. This most recent development leads to Granger Aerospace Products now holding its first two TSO authorizations from the FAA. Granger Aerospace Products is now certified to launch its line of unique ULD's including LD 2, LD 3 and LD 8 containers. The containers are all staples in the air cargo and commercial airline industries. 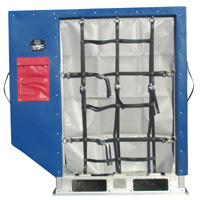 The certification applies specifically to the LD-3 Air Cargo container. The polyethylene construction of the Granger ULD containers offer a longer lifespan and significantly lower maintenance costs reducing overall operating costs as well as time lost for repairs. Changing from the current materials of fiberglass, aluminum or sometimes polycarbonate may also offer savings in other areas. The lighter weight design saves in fuel burn over some current containers. Many businesses in this industry are urgently looking for changes that will use resources most economically and the Granger container offers a solution to this issue. Granger Plastics has been involved in custom production of thousands upon thousands of air cargo containers. All of the containers produced by Granger are rotationally molded polyethylene and made from the highest quality materials. Granger Aerospace Products are being manufactured in Middletown, OH. Granger Aerospace also offers custom design and manufacturing capabilities for continuing conversions of air industry parts due to the many benefits of polyethylene. Granger Aerospace is a full service facility capable of everything from design to manufacturing and completed assembly.